Every frame comes complete with 4 slide and click interchangeable lenses in gold (driving), blue (winter), and red (summer) with a prescription suitable gaskit. With “skull fit” temples and “no slip” rubber detail on the arms, these sunglasses are suitable for wearing under a helmet. 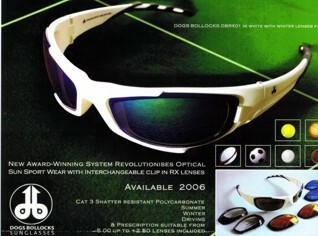 The shatter – resistant polycarbonate lenses are category 3 classification and meet European/ Australian/ USA standard.